I picked up a couple of different brands of 16GB microSDHC cards for my nieces' generic Android tablets. Since they each got one, I figured I would be clever and get two different brands of cards so that I could compare them and see which was better. The cards I got were a Kingston 16GB microSDHC Card (SDC4/16GBSP) and this Mushkin 16GB microSDHC (MKNUSDHCC4-16GB) Card. I also previously reviewed a Patriot Signature Line 16GB microSDHC Card (PSF16GMCSDHC43P) that I picked up for a Motorola DROID 4 Phone, so that gives me a good variety of similar cards from different manufacturers. All three cards are 16GB in size, they are all microSDHC and they are all Class 4 cards. Having similar sizes and speed ratings, you would think that they were all pretty comparable... but you would be mistaken as one of these cards is ahead of the others by leaps and bounds when it comes to performance. This review will focus particularly on the Mushkin 16GB microSD Card, though I will poke at the others for the sake of comparison. First of all, the Mushkin card arrived in a nice blister pack. Opening it up I was presented with a familiar plastic case 2" wide by 1.5" tall plastic case containing the microSDHC card itself, as well as an SD adapter so that I could use the card in a regular SD card slot. I don't care if every one of my cards comes with an adapter, but it's sure convenient to have at least one on hand so any time a card does come with one is an added bonus. The transparent plastic case is also pretty nice; it's fairly sturdy and has a latch on the right-hand side to make sure it stays closed and your precious cards don't come tumbling out and get lost. There are form-fitted notches inside the case that both the card and the adapter sit into so they're also not banging around inside the case. The adapter simply says "microSD Adapter" on it and is otherwise plain black, and features the standard write protect locking lever on the left hand side to prevent overwriting data. The card itself has the Mushkin brand name, microSDHC and 16GB written on it but is otherwise plain black as well. Both pieces have the standard notch in the top left corner to prevent them being inserted upside down or otherwise incorrectly. Being a Class 4 card, this card should adhere to a minimum 4 MB/s speed for both reading and writing on a new empty card. This coincides with the sequential speed test in the below benchmarks. Your data will not always be written and read in order from a fresh card though, so I also find it important to check out the random speeds for 512k and 4k chunks of data to get an overall picture of how the card will perform for me. 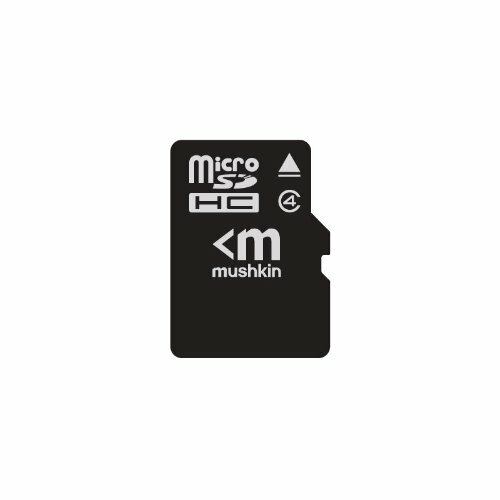 The Mushkin 16GB microSDHC card comes preformatted with the FAT32 filesystem and has a total capacity of 15,464,398,848 bytes (14.4 GB). Windows 7 offered to let me use it for the Windows ReadyBoost feature; while that's not really useful these days with the price of RAM being so low, it at least tells me that the card meets the minimum speed requirements to be used as such. I've used Mushkin memory modules in the past and was happy with them, so I had high hopes for this card. Benchmarking was done using CrystalDiskMark 3.0.1c using the default settings. Interpreting the results we see that the sequential read speed and random 512k read speeds were good, which is to be expected. The sequential write speed was well over the 4 MB/s minimum as well, but the random 512k and 4k writes were average to slow. The Kingston card I picked up at the same time for the same price was pretty comparable across the board, but it had random 4k write speeds much slower (0.07 MB/s). On the other hand, the Patriot card had significantly faster write speeds across the board for the same price... as well as a larger total formatted capacity (14.9 GB as opposed to 14.4 GB). It's not that this card is slow, it does fall within the SD Association Class 4 speed range, it's just that the Patriot card I had before was so much faster and identically priced. This card is perfectly average in every way and should work well in any device that requires a Class 4 card. It works well in the tablet and would work similarly well in a phone or camera, and is fast enough to write a streaming HD video recording from your device. However, if you don't find it on sale somewhere I'd suggest picking up the Patriot card instead since it has significantly faster write speeds for the same price.